Here's a great recipe to try at home. A great source of fibre, protein and good quality fats. Enjoy! 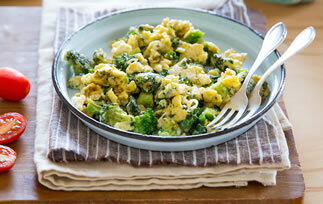 In a bowl, whisk the eggs, milk, and fresh chives/spinach/zucchini/broccoli. Season to taste. Melt some coconut oil in a pan and add the eggs when hot. When the eggs start to settle, add the smoked salmon and cook for 1 -2 minutes. Serve with chives sprinkled on top.